Robert Frank is undoubtedly one of the most celebrated photographers of the 20th century. His photography book The Americans is a classic work of documentary photography (arguably the seminal work of documentary photography) that has inspired countless people to pick up a camera themselves or, at the very least, perceive the world in a way they hadn't before. However, great works often cast long shadows, and the intense celebration of The Americans seems to obscure Frank's other accomplishments and endevours. 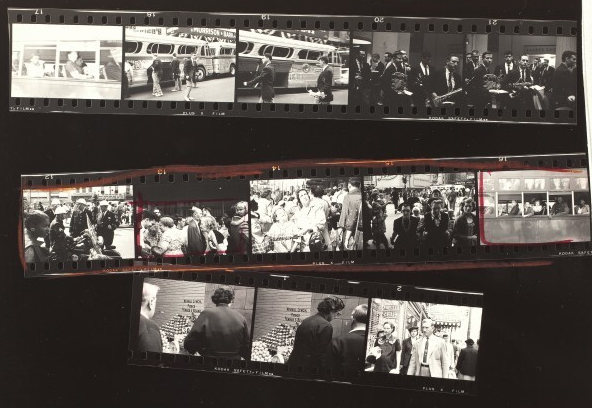 Enter the National Gallery of Art's online Robert Frank Collection, an expansive resource including vintage prints, contact sheets, work prints, negatives, three bound books of original photographs, technical material, and various papers, books, and recordings which span 1937 to 2005. These materials do much to contextualize Robert Frank's most celebrated work into a grander oeuvre and highlight those pieces which have been lost to the wayside. One of the most exciting parts of the collection are Frank's contact sheets, where one can almost imagine the split second decisions he made photographing in the field and watch micro-narratives emerge across a string of images before vanishing into something new.